Monero (XMR-USD) continues to face a lot of downside risk as strengthening Bitcoin prices caused the Monero component of this crypto pair to be sold hard in the last two weeks, further dampening any hopes of immediate price recovery. This analysis focuses on the expected market action for XMR/BTC in the weeks ahead. Some weeks ago, Monero was shaken by Ledger wallet developers announcing a bug in the Nano S Monero app which caused a client to lose 1,680 XMR. Furthermore, the strengthening of Bitcoin prices has served to further dampen the price of an asset that’s clearly struggling in the market. Monero has managed to stay about even on BTC this year, in terms of trade pair and USD value increase. Both have seen a near 40% increase since Jan. 1. News from the coin and team haven’t been in abundance in 2019 and the community is waiting to see if Monero’s XMR coin can find adoption as a faster and more private alternative to Bitcoin. 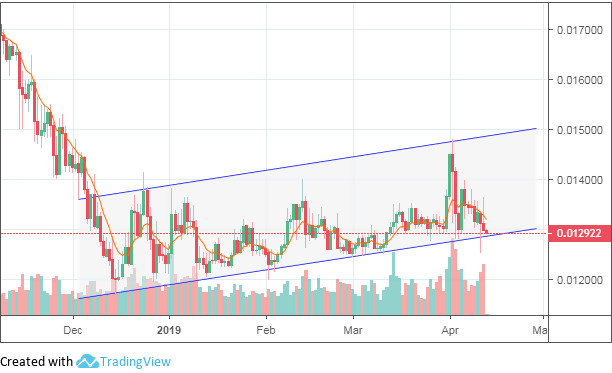 The technical outlook for XMR/BTC starts on the weekly chart, where we see that the price candle has started to test the lower channel line once more, spurred on by BTC strength. The continued show of force of Bitcoin, which has seen it breach the $5,400 mark against the USD, has put the XMR/BTC asset under severe pressure. The length of the red (sell) volume bars is an indicator of just how hard investors are dumping XMR in favor of BTC. The active weekly candle also has broken below the 9EMA line, further strengthening the bearish bias for this crypto pair. 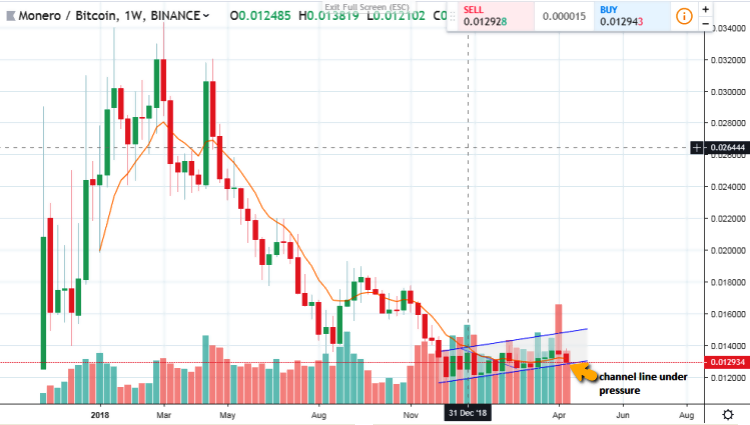 The situation on the daily chart is a mirror of what is happening to XMR/BTC on the long-term weekly chart. Here, we also can identify the channel, as well as the sequence of candles over the last few weeks, which show how prices have tested the lower channel line much more than the upper channel line. We also see from the daily chart that the selling pressure is increasing, as evidenced by the rising amplitude of the sell volume bars. So what are the possible trade scenarios for the XMR/BTC crypto pair? There are a lot of pointers to indicate that the lower channel line may give way sooner than expected. There’s a predominance of selling volume, which is shown to be increasing on the daily chart. Also, the dynamic support/resistance 9EMA line has been broken to the downside (a bearish signal), and the lower channel line is being tested once again. We should also remember that BTC’s strength does not show any sign of abating in the short term. If we are to consider the pre-channel price action together with the channel pattern on the weekly chart, then we can think of the price move from 0.018 (November’s highs) to the present time as a bearish flag formation, which is just waiting for the downside break to complete the pattern. The week starting April 15 will be crucial. If the weekly candle closes below the lower channel line (with a 3% penetration factor), the bearish flag would be complete and a price move that is equivalent to the height of the pole (price move from 0.018 BTC to 0.014 BTC) will play out to the downside. Usually in a flag formation, the height of the pole determines the distance of the projected breakout move. The only other scenario that could be seen would occur if BTC starts to lose some strength in the market. We would then see the price action bounce from the lower channel line, and make a push to the upper channel line. However, this move has to see some buying volume to manifest. Please note: This analysis was done on the weekly chart, and therefore the price moves may take several weeks to play out. Did you know the crypto market is up 40% since Jan 1st? Is the bear market over? Is Bitcoin going to shoot up like it did in 2017? We provides news, research, technical analysis and more at the Coin Agora on all things crypto! Sign up now and get instant access to our 2019 Pick Portfolio—where three of our picks are up more than 80% since January! Why did Coinbase go for Ethereum Classic (ETC) instead of Ripple (XRP)?